Our two bedroom/ two bath unit affords you spectacular views of neighboring Molokai and Lanai. You will enjoy the comforts of your home in paradise. The kitchen is fully furnished for your convenience. Sit on the lanai and enjoy the beautifully landscaped property while spotting the sea turtles that have made Mahina Surf their oceanfront home. We keep the unit comfortable and updated since we consider this our family home on Maui and often meet there for relaxation and fun. Our family has enjoyed yearly trips to Maui and look forward to coming home to Mahina Surf #212 each year. The unit is owned by five siblings. Family members are very grateful that their parents chose Mahina Surf #212 as the Maui home. They have watched the palm trees grow as is evidenced in their extensive collection of sunset pictures. 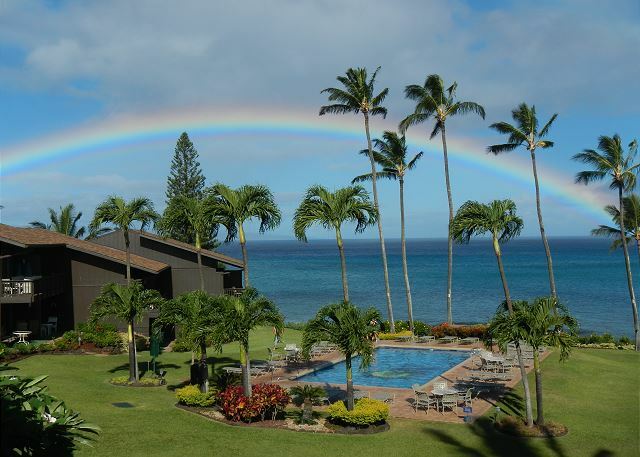 You will feel a sense of ohana with the Mahina Surf property managers and offce staff. We stayed in 2 bedroom condo - it was very well maintained and in a great spot. The onsite staff were very helpful and the facilities were excellent. We had a wonderful stay at Mahina Surf. 4 adults, 1 toddler, and a lot of FUN. The staff was wonderful, so helpful and attentive. The property was beautiful, clean, quiet, and so inviting. We saw birds, sea turtles, and endless amounts of whales right from our patio. Such magic. We will definitely be coming back. We always feel like we’re home again when going to the Mahina Surf. Love the scenery, kids love the pool plus the bbq grills with a view of the ocean. Not to mention the turtles that come up to the beach. Karina M from Munich does not recommend this vacation rental. We were spending a few nights in Mahina Surf, which is a couple of miles up north from Lahaina. The property itself has a nice location right at the ocean front. So the view is the main plus. The appartments are owned by different people and thus are in different states. We lived in 212. I got to say that we are used to a very different ( and much!! better) standard for that amount of money! The furniture is at least back from the 80ies and the kitchen furniture could use a propper cleaning of the door knobs etc. Also as the bedroom was facing the parking lot, you hear the people leaving and talking as if they were standing next to your bed. However, the general area was well maintained and the staff friendly. The critic is meant for the owner. We would not spend that amount of money again with furniture as old and used as this. ( Bathroom seemed to have been renovated recently however. Nonetheless this appartment could defo use a new bed and matress!!! !, new lights, couch,... and a thorough cleanse of the kitchen). Beautiful setting with great sunrises and sunsets. Fun to see 16 turtles resting on the beach all at once. Very comfortable condo for three of us and fast response to problem with the refrigerator. Very nice and comfortable. No AC but didn’t need it bring oceanfront. Clean, great location. We were very lucky to find Mahina Surf! We loved the condo the view was amazing and we got to see sea turtles right on our beach. We will definitely be back! Tammy was great at the front desk! Family Getaway at the perfect spot! We had a wonderful stay! Perfect loft style for our family with grandparents and kids. We enjoyed drinks on the lanai, watched whales and got to see the resident turtles daily! We had a lovely visit to Mahina Surf. Th location was excellent - away from the hubbub of Ka'anapali, but close to everything you could possibly need, as well as great beaches for snorkeling. It was our friends' first visit to Maui and they loved it. My only suggestion would be to have an iron available. The lanai was perfect - a straight on view of the ocean. we actually got to see one of the last whales of the season, plus several pods of dolphins. Turtles were everywhere - many came up on the beach next door to sleep in the sun. Overall a very relaxing and delightful trip. We'll be back. Wow! What a fantastic condo. Amazing location and so clean and well kept. Bathroom renos were professionally done, beds were comfy, kitchen was well-stocked and the view was phenomenal. A great little beach 5 minutes away or other, bigger beaches 10-15 min by car (I highly recommend DT Fleming beach). Lots of amenities close by including two good groceries. We had heard the weather on this part of the island is wetter but that wasn't our experience at all. Thank you Mahina Surf for an unforgettable vacation! Condo has great ocean view. 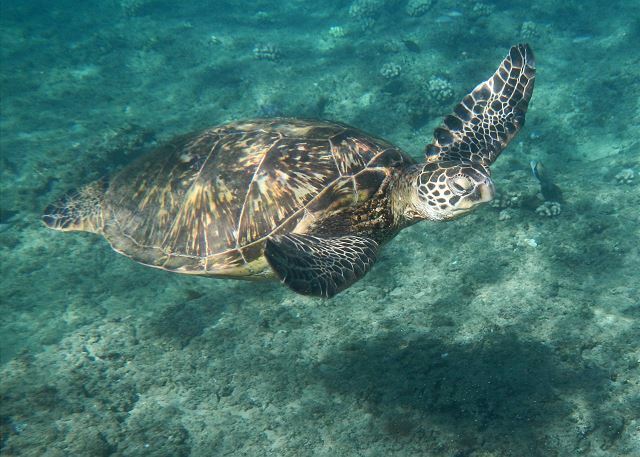 We saw many sea turtles right outside the complex. Swimming pool is beautiful and heated. The management was helpful and told us that we could reserve half if we have late flight. Bathrooms are remodeled and every room has fan. Inside, the bathrooms only has soap bars so we had to buy our own shampoo, conditioner and lotion. The kitchen has most daily cooking stuff, but it doesn't have foil, zip bag, or food wrap. It also has some salt and pepper and other seasoning, but it doesn't have cooking oil. TV remote doesn't work well so we didn't watch TV. The windows are not those soundproofing windows we have at home. They are more like blinds so we heard everything happening outside, luckily the road was not too busy but we still got quite a few traffic noise. The washer and dryer are not inside the condo so we had to take our dirty clothes down to the coin operated washer and dryer which was a little inconvenient. Upstairs has two beds but it is a loft setting so we did see and hear other people in the condo. Overall we enjoyed our stay and will visit again, probably bring more supplies ourselves or arrive early so we have time to buy. The condo is about 1 hour drive from the airport which is not trivial. Mahina Surf is a gem. I found it years ago and still get goosebumps each time I come--ot from cold of course, but from the peaceful green spot of heaven that it is. No crowds of tourists, just folks who appreciate the ocean, the whales, the gardens, and the comfortable condos. It's cleaning staff is thorough and creative with amenities. Its office staff is cordial and feel like old friends.